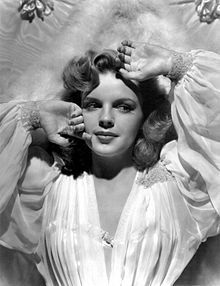 Judy Garland (n. 10 iunie 1922 - d. 22 iunie 1969) a fost o cântăreață și actriță americană de film. A Holiday in Storyland 01930 1930 Herself, with the Gumm Sisters Includes Garland's first solo number, "Blue Butterfly"
A Star Is Born 01954 1954 Vicki Lester (Esther Blodgett) Garland won the Golden Globe Award for Best Actress in a Musical or Comedy and was nominated for an Academy Award for Best Actress. Judgment at Nuremberg 01961 1961 Mrs. Irene Hoffman Wallner Garland received Oscar and Golden Globe nominations for Best Supporting Actress. ^ a b c „Judy Garland: Biography”. TV Guide. Accesat în 3 iulie 2008 . ^ a b „Judy Garland”. Hollywood Foreign Press Association. Accesat în 24 decembrie 2007 .